The Institute of Buddhist Studies (IBS) was honored to host the International Association of Shin Buddhist Studies’ (IASBS) 17th Biennial Meeting, held over the weekend of August 7-9, at the Jodo Shinshu Center in Berkeley. Panelists came primarily from North American and Japanese universities as well as Brazil, Taiwan, and Europe. Approximately 100 registrants and guests attended the three-day conference. The IASBS is the world’s only scholarly and professional organization dedicated solely to the study of Shin and Pure Land Buddhism. Founded in 1982 by a group of Jodo Shinshu scholars in Japan, the organization today has nearly four hundred members in six districts across the globe. The Biennial Meetings serve as the primary means by which members gather, share their ongoing research, and foster community among Shin and Pure Land scholars, thinkers, and teachers. The theme of the 17th Biennial Meeting was “Subjectivity in Pure Land Buddhism.” Forty papers and a keynote lecture were delivered on such topics as: ongoing clinical and pastoral work among Shin Buddhist priests in Japan; Vietnamese-American Pure Land Buddhists in Nebraska; gender, identity, the body and ritual in Shin Buddhist thought and practice; the cultural transformations and adaptations of Pure Land Buddhism in new historical contexts; modern Japanese Shin Buddhist subjectivities from multiple perspectives, both Hongwanji’s, and historically. In his keynote lecture, “So distant and yet so close: contemporary reflections on the hope of a limitless light,” Prof. Luis Gómez, University of Michigan, emeritus, discussed the importance of hope within the narratives of Pure Land Buddhism. Panelists came primarily from North American and Japanese universities as well as Brazil, Taiwan, and Europe. Approximately 100 registrants and guests attended the three-day conference. On the evening of August 7, Prof. Lewis Lancaster, University of California, Berkeley, emeritus, was awarded the Second Annual IBS President’s Award in recognition of his decades of support for the Institute of Buddhist Studies. When he began the Buddhist Studies group at the University of California, Prof. Lancaster was aided and supported by the Berkeley Buddhist Temple and the already existing Institute of Buddhist Studies, and he has been a long-time supporter of the Institute’s programs. On Sunday August 9, the conference concluded with a special screening of Buddhism After the Tsunami: The Souls of Zen, 3/11 Japan Edition, an important documentary about the Japanese Buddhist response to the triple-disasters of March 2011. Director Tim Graf joined a post-film discussion from Germany via Skype. We would like to take this opportunity to express my profound gratitude to the staff and volunteers from the Institute of Buddhist Studies, the Jodo Shinshu Center, the BCA Center for Buddhist Education and the Berkeley Buddhist Temple who worked tirelessly throughout the week to ensure that all conference participants were well cared for and welcomed into our community. It is this sense of collaboration and mutual support that gives me a deep sense of hope in the long-term growth of Shinran’s teachings in the West. Delegates from the Shinran symposium. 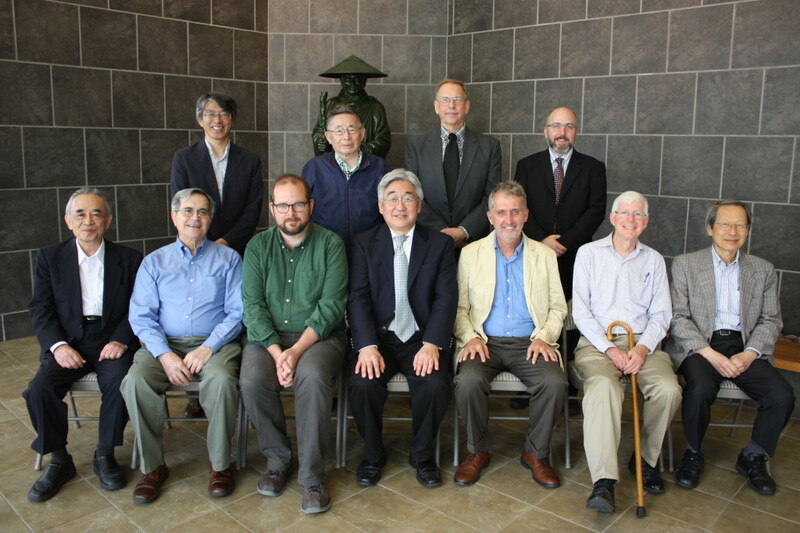 Bottom row: Ichigyo Oyama, Luis Gómez, Mark Csikszentmihalyi, David Matsumoto, Charles Hallisey, James Fredericks, Dennis Hirota; top row: Mitsuya Dake, Seigen Yamaoka, Richard Payne, Scott Mitchell. The symposium featured scholars who are collaborating to produce a new work on the Larger Sutra with Shinran’s commentary and attendant notes. Buddhist scholars and theologians addressed “the question of how Shinran’s treatment of the Sutra of Immeasurable Light might help us to understand what it means to read a Buddhist text and what such reading might entail, require or imply.” Over 60 people were in attendance for this event. This is the first one I attended as a layperson from my temple [Buddhist Church of San Francisco] and it was very overwhelming but also very inspirational to hear what scholar’s had to say about Shin Buddhism. It would be nice to have a quarterly follow up panel conference by at least three keynote speakers to continue the dialog . My present concern is how to disseminated this vast amount of inspirational material and knowledge to the Sangha as a whole and in the simplest terms possible. Not everyone on the Shin path buys the books but only rely mainly on the Minister for Dharma talks which do not include these materials from this event.